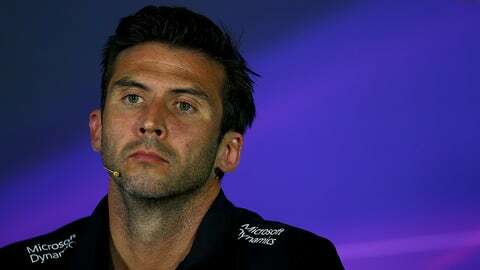 Lotus F1 CEO Matthew Carter during a press conference before the Italian Grand Prix in Monza, Italy. Matthew Carter, CEO of Lotus F1, still doesn’t know when the planned takeover by Renault will be finalized. After Suzuka, both sides announced that a letter of intent had been signed, but cautioned the deal would only go through if certain conditions were met. "I honestly don’t know," Carter said when asked about the likely time scale. "We’re working on things. It’s clear that all the parties involved want to get this resolved as quickly as possible, and we’ll work thing through as quickly as we can. Although Carter would like to hurry up the process, he is still focused on finishing this season. "It’s the same for us anyway, it really doesn’t make a helluva lot of difference," Carter said. "We get on with doing our job on the racetrack. We’ve been confident for a long time that things are going to be resolved. It’s just taking a long time." However, Carter admitted that the delay was not positive. "It’s not helping, but at the end of the day as we’ve always said we’re here, we’re racing, we’ll be at all the races," Carter said. "What happens behind the scenes or what happens above our level will happen." The letter of intent has given Lotus more time with its ongoing legal case, and Carter admits that some of the pressure is off. "The legal process was the legal process and we were always confident that it was going to be resolved and we were going to get through it," Carter said. "But it’s hard to say too much and talk too much when you’re in the middle of things." Carter insisted that Renault’s attempt to get a better deal with Bernie Ecclestone is not the cause of the hold up. "To be perfectly honest I don’t think there’s a sticking point," Carter said. "I think it’s just a case of everyone working as hard as they can and as fast as they can to get the thing resolved as quickly as possible." Meanwhile when asked by Motorsport.com why the process was so slow, Ecclestone claimed he had no knowledge as to why this was the case. "They say they’re going to buy it, I’m sure it’s not that they’re running out of money, I’m sure there are other reasons. Maybe the sellers aren’t really sellers."